Our cat Eleni, aged nearly 18, has recently become deaf. We don't know exactly when it started, and presumably it was a gradual process. It took us a while to be certain. The symptoms of deafness include, obviously, not reacting to sounds. Eleni stopped responding when called, and also stopped being startled by loud noises like she used to. She also started meowing really loudly, because she can't hear herself. Deafness is common in senior cats, and there's nothing to do about it. When we told the vet, he just shrugged. But while we can't change her condition, we have had to adapt our interactions to this new situation. First, we obviously can't call her. We have to get into her field of vision and make hand gestures at her. She is learning to come when beckoned. We also can't comfort her by talking to her when she meows in another room, and have to get up and go to her, see if anything's wrong, and help her get settled. We have to accept the loud volume of her meows, which have often made people talking to me on the phone to comment on my "crying baby"! We have to be careful not to startle her when we approach. It can be disconcerting when we walk up behind her and she doesn't realize. So we have to try to move gently into her field of vision so she sees us. I've also tried treading more heavily on the floor, hoping that she'll feel the vibrations of my footsteps, but this doesn't seem to work. Perhaps our tiled floor doesn't pass the vibrations as well as a wooden floor would. 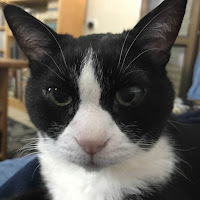 One advantage of her condition is that she is no longer upset by loud noises, including dogs barking outside and things like sirens and thunderstorms. In fact, she now sleeps more deeply, sometimes for many hours. Eleni has also become more interested in watching the computer screen, where we watch kitten cams, live safaris, and various films and series. She seems to recognize cats on screen, and particularly enjoys watching birds. I wonder what it felt like to have her hearing gradually weaken and disappear. Does she feel isolated? Does she feel threatened by not having this important sense? The only thing I can compare this to is my frustration as my eyesight became imperfect before I got glasses, but that is nothing like losing a sense entirely. I miss seeing her swivel her ears around to hear sounds coming from different directions. Her ears are now almost permanently in the relaxed, front-facing position. I still talk to her. This is partly because it's a habit and I do it for my own benefit, as part of treating her as a person. I also hope that perhaps when she's sitting on or next to me she might sense the vibrations of my speech. To make up for the lack of vocal communication, we spend more time stroking and holding her. She's always been a very tactile cat, and now that she's elderly and less active, she demands and receives even more physical contact. I hope that this makes up for the loss of her hearing as much as possible.